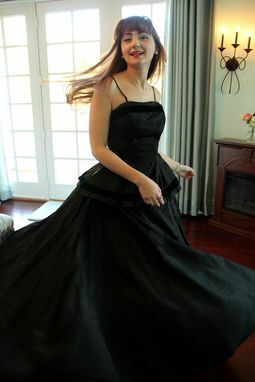 Vintage 40s black silk taffeta and velvet skirt and top ensemble by Mary Muffet (1938-1953). 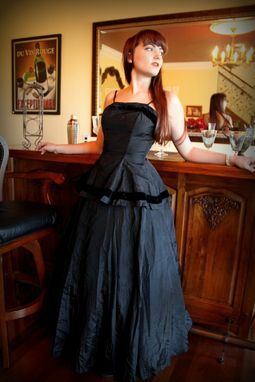 The top features spaghetti straps and a very fitted waist then a full circle peplum. Both the neckline and peplum hem are trimmed with a thick border of black velvet. 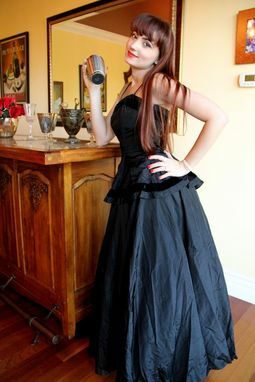 The skirt is high waisted and very full (shown over a pettiskirt- not included) and the hem is also trimmed in velvet. The skirt zips up the back and buttons up, the top zips up the side with its original metal zipper in working order. I am happy to alter the dress to your measurements, or make an entirely new dress for you in this style, custom made to your figure. Please contact me if you're interested in either. This gown ships via USPS Priority (1-3 days within US, and 5-10 Internationally). Parcel Post Shipping is available for less, and Express for more, please contact me to arrange other shipping methods.